This story is the second installment in a series on copper reduction. Part 1 was published in the Feb. 13 issue; the next installment in this series will be published March 13 and will feature more perspectives on this complex issue. If you are a boater at Shelter Island or Marina del Rey and would like to share your perspectives about TMDL and copper reduction, please contact the writer via email at parimal@thelog.com. SAN DIEGO — All eyes are on San Diego Bay. Specifically, recreational boaters, legislators and many government agencies are watching how Shelter Island keeps pace with a regulatory order requiring port officials to reduce copper levels 76 percent by 2022 in the northwestern corner of San Diego Bay. The first mandate imposed on Shelter Island was reportedly satisfied. In 2013, Port of San Diego officials announced copper levels were reduced 10 percent. Port officials are now looking to meet its next goal: reduce Shelter Island’s copper levels 40 percent by 2017. If Shelter Island is able to keep pace with the state mandate, other harbors and marinas could begin imposing Total Maximum Daily Load (TMDL) requirements to reduce copper levels at their respective venues. TMDL is essentially a budget of how much copper is allowed to be discharged into the water. Copper levels above the budget can be harmful to marine life, according to state officials. Legislators and state officials began studying copper levels and looking to implement TMDL requirements since the early 2000s. Since 2001, various reports and studies have indicated copper levels in Shelter Island and Marina del Rey were significantly higher than federal and state mandates allowed. Accordingly, government officials and environmental activists urged change, including pushing recreational boaters to switch from using copper to an alternative paint to protect their boat hulls from corrosion. They were armed with a bill signed into law by Gov. Gray Davis in 2001 and The Carson Report published in 2002. A few years later, Shelter Island Yacht Basin in San Diego was the first marina to be subject to TMDL mandates and experiment with alternative hull paints. Last year, port officials said they were making progress in reducing copper levels at Shelter Island. The copper levels at Shelter Island reportedly exceed federal and state standards, according to port officials. A regulatory order required Shelter Island to reduce copper levels 10 percent by 2012, a goal the port reported it achieved. Looking ahead, Shelter Island must reduce copper levels 40 percent by 2017 and 76 percent by 2022. A resolution adopted by the California Regional Water Quality Control Board (San Diego Region) identified copper as harmful to aquatic life. The resolution added 98 percent of copper levels at Shelter Island were traced to copper-based antifouling paints applied to the hulls of recreational boats. “We’re making progress toward 40 percent [copper reduction]. We have several programs we’re working on,” Karen Holman, environmental and land use manager at Port of San Diego, said. Holman said boaters at Shelter Island were offered a grant to incentivize conversion from copper to alternative hull paints or coatings. About three dozen boaters participated in the voluntary conversion program to date. Grant funding is set to expire in June, meaning Shelter Island boaters interested in experimenting with hull paint conversion must sign up by April. According to Holman, the grant, which applies only to boaters who switch to non-biocide paints or coatings, covers about 70-80 percent of the conversion costs. The exact price tag varies from boat to boat, with its size and need to be stripped factoring into the cost. On average, boaters have received between $5,000 and $8,000 in grant money. Holman added the port hopes to find another grant option for boaters in the future. 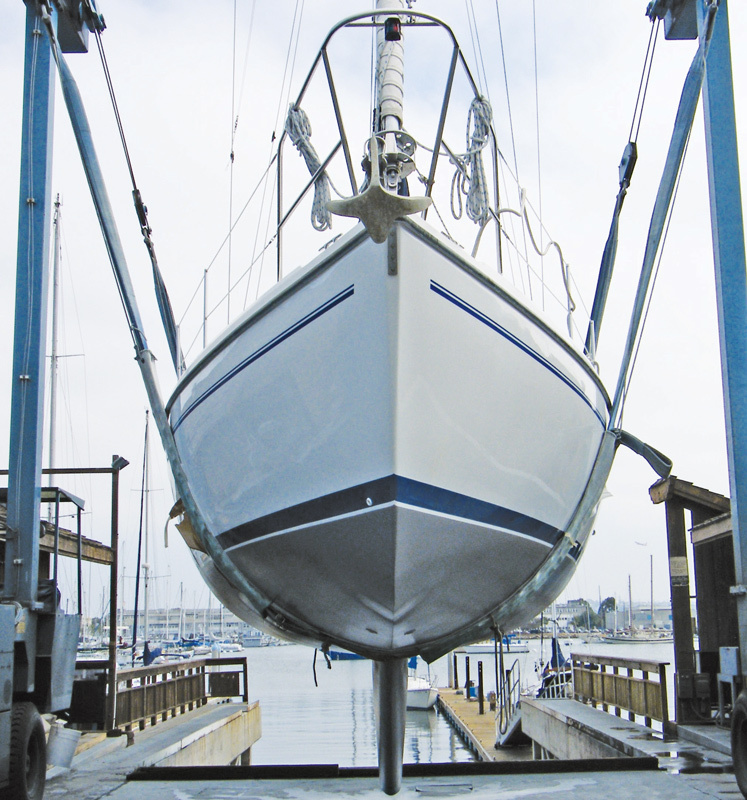 In the meantime, she is hopeful Assembly Bill 425 (AB 425), which was enacted in 2013, will help all harbors and marinas in California control copper levels. When Shelter Island began working toward meeting its 10 percent mandate a few years ago, Holman said boaters expressed some resistance to change. Many did not believe the alternatives would work. However, most boaters who participated in the grant program claimed to ?be satisfied with the conversion, Holman said. She added some boaters said they experienced faster speeds, because the alternative paint or coating resulted in smoother and slicker hull surfaces. She added the Port of San Diego is still working on developing baywide projects, such as enacting a permitting process for in-bay hull cleaning and requiring best management practices. How successful Shelter Island is in meeting its copper reduction goals by 2022 will ultimately depend on its management strategies, implementation of best management practices and the types of alternative paints or coatings boaters elect to use. Still, Holman believes AB 425 will make reformulated copper paints more accessible to boaters and help officials develop policies to better regulate polluted waters. “We believe there is benefit in a larger economy,” Holman said about the state’s copper reduction mandates. San Diego Port Tenants Association (SDPTA), which is located on Shelter Island, has been working with regulatory agencies, yacht clubs, marina managers and boaters to make the copper-reduction process as smooth and managed as possible. Cloward said SDPTA has benefited the process by building a coalition and educating boaters as much as possible, but there is still some confusion among boaters. There has been a lot of pressure on paint manufacturers, she said. Some applications have not worked well. Boatyards are willing to sell what works, but it is not illegal to sell copper paints. Compounding the problem: Shelter Island is home to a lot of boaters from Arizona who visit seasonally. Accordingly, educating them about copper reduction and TMDL is difficult. Meanwhile, yacht clubs can mandate copper quotas, but marinas do not have that same luxury. John Adriany, a scientist at Chemetrics, said the brunt of the responsibility for copper reduction and TMDL compliance has fallen on marina and yacht club managers. Both Cloward and Adriany believe the 40 percent mandate will be ahead of schedule. However, they feel achieving 76 percent reduction by 2022 is a real challenge. “We’ve been asked to do a job and that’s to reduce copper progressively. We don’t know if the efforts that have been prescribed will lead to the numbers that have been set,” Adriany said, adding copper is everywhere in San Diego Bay, and the geographic design of the harbor offers little assistance, in terms of water exchange or tides. A lot of money has been spent on testing, as well. According to Cloward, the big question in researching copper in San Diego Bay is whether toxicity exists. Is copper really a problem? Shelter Island might be a big lab, but Adriany pointed out the marina occupies only 2 percent of San Diego Bay. Yet, Shelter Island is the only place with an active TMDL program implemented and enforced. Still, Adriany and Cloward are hopeful about what the future holds. Adriany said while reducing copper levels 76 percent by 2022 will be tough, Shelter Island is making positive progress in meeting its benchmark for 2017. Specifically, he said Shelter Island achieved 27 percent copper reduction through 2013 and is on pace to reach the 40 percent benchmark ahead of the state’s 2017 target. He also finds promise in AB 425, which, through a combination of science and legislation, could give policymakers and regulators the tools they need to ultimately find the right solutions. Echoing Holman’s sentiments, Cloward said SDPTA has worked with all the marinas in San Diego Bay to implement best management practices. Although the other marinas in the bay do not yet have TMDL mandates imposed on them, Cloward said they have been proactive in addressing copper pollution. She added SDPTA is going to try to make regulations as reasonable as possible. “It requires absolutely everyone to be involved in this thing,” Adriany said.